Don Smith (California, United States) on 14 September 2008 in Landscape & Rural. With fall equinox just seven days away, I thought it would be fun to post one of my more memorable images captured during an early October snowstorm in California's eastern Sierra; this also happens to be my wife Beri's favorite lake to hike. I was with a couple of my shooting buddies, Mike and James, on a five-day trip to photograph fall color in the canyons between the small communities of Lee Vining and Bishop. We awoke the first morning of our trip to a full-blown snowstorm (the weather called for sunny skies in the 50's). We saw this as an awesome opportunity to shoot images juxtaposing the two seasons of fall and winter. Once the snow stopped falling, around mid-morning, we drove to Convict Lake (just south of Mammoth Lakes, two miles west of Highway 395) and were treated to this breathtaking clearing storm scene. The mountain at the end of the lake, Mt. Morrison, towers over 12,000 feet but on this day was obscurred in clouds. 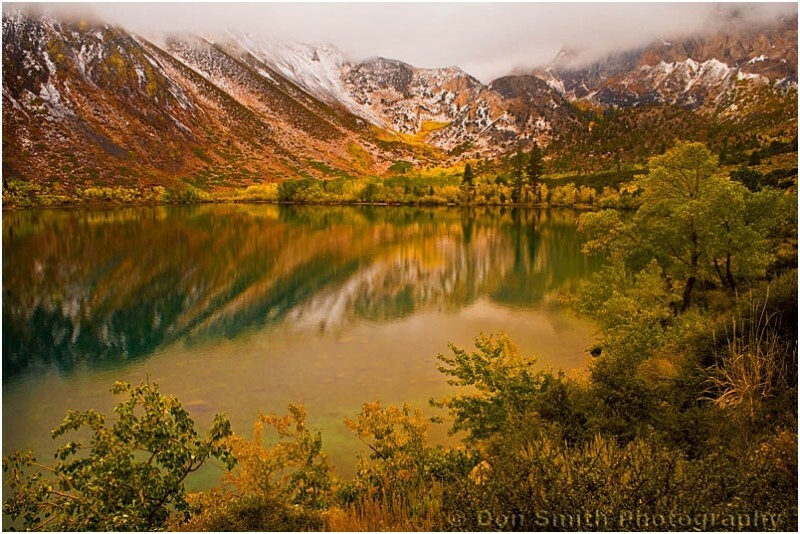 This alpine lake is photographable regardless of the season; however, the chance encounter of beautiful fall color and fresh snow made it an unbeatable photographic experience. I will be travelling back to the eastern Sierra in a couple of weeks to co-teach a fall color workshop with my partner Gary Hart. To find out more about our workshops, please visit my website at http://www.donsmithphotography.com and click on the Workshop tab. Very beautiful colours and capture; breathtaking with that little touch of snow on the mountains and the reflection in the lake. Lovely autumn colors, great work. Wonderful tone and colour, that water looks amazing, great image! Thanks you all or your kind words. Convict Lake has always been what I consider a "secret gem" to photograph. This past year however, it was featured in a national television advertisement here in the States for a granola bar company - not sure if it will stay a secret much longer. Thanks Marion and Stefan - it's nice to hear from both of you!